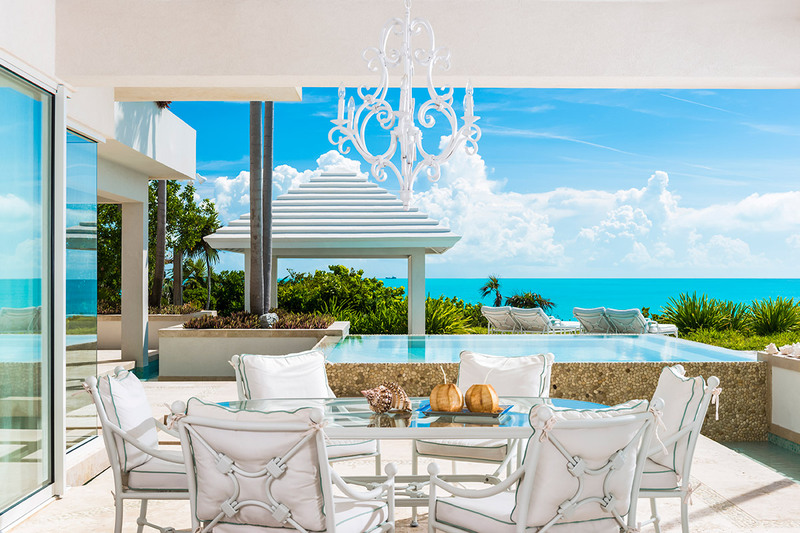 Lidija House 7 BR Villa Rental – Turks & Caicos -Located along Provo’s stunning Long Bay Beach, Lidija House is the flagship of the three homes which make up The Pearls of Long Bay Estate. Lidija House offers guests uninterrupted views of the turquoise waters spanning the Caicos Banks while marrying contemporary design with Caribbean barefoot luxury. This stunning home incorporates indoor and outdoor living, beautiful landscaping and decks and lagoons throughout for 12,000 square feet of sophisticated living. In addition to the beautifully landscaped gardens, private pools and lagoons spanning the properties, Lidija House Shares first class amenities with Pearls East and West that you would expect at a five star resort. Continue your workout regime in the state of the art and fully equipped 1,000 square foot gymnasium or get together for some tennis on the championship court. Relax in the Turkish steam bath, sauna and alfresco massage pavilion with adjacent powder room and shower.